Powers/Abilities/Functions: The town of Revelation seemed to affect technological devices via an atmospheric disturbance that surrounded the town. Technological devices would to malfunction or short out within the confines of Revelation. The town also seemed to house quite a bit of strange goings-on, including unexplained disappearances, UFO sightings and sightings of a Bigfoot-like creature called the Howler. (Fantastic Four III#33 (fb) - BTS) - Around the start of the 20th Century, a mirror was made from a shard of reflective crystal (actually a type of chronal crystal) found near the old copper mine in the small Arizona town of Revelation. The mirror was said to show the user something different about themself each time it was looked in. Over the years, Revelation made a name for itself as a town with colorful lore, including unexplained disappearances, UFO sightings, and their own version of "Bigfoot" called the Howler. The town was also home to the Royale Desert Drive-In Theater and Ma Rose's Antiques. (Fantastic Four III#34 (fb) - BTS) - Revelation developed a history of harboring fugitives and refugees. Anastasia Contrares, born in 1940, became the local Queen of the State Racers, before dying in a car accident in 1961. Months after, people began seeing Anastasia driving her el Dorado car along Revelation's roadways. 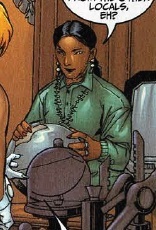 (Fantastic Four III#33 (fb) - BTS) - Ma Rose, owner of Ma Rose's Antiques, died in 1979. (Fantastic Four III#33) - Twenty years later, after a saboteur bombed the interstellar transceiver contained within the laboratory wing of the Fantastic Four's headquarters, Pier Four, the Fantastic Four traced the saboteur to the American Midwest using soil samples from the bomb. While traveling through Arizona, the Fantastic Four lost control of their Fantasti-Car and were forced to land in the small town of Revelation. Once landed, the Thing managed to regain controls and get the Fantasti-Car airborne once more, flying it straight until stopping just in front of police Deputy Beauregard Feiffer, who sternly reminded the Thing that he was the law in Revelation. He then asked the Thing if the Fantasti-Car was licensed by the FAA and warned Thing to get the Fantasti-Car out of the streets before Feiffer had it impounded. Mr. Fantastic then attempted to clear up any misunderstanding the Fantastic Four might have caused with their appearance in Revelation, explaining that they were looking for a saboteur who had attacked their headquarters, but Feiffer exclaimed that if they wanted police aid, they would need to file a request with the sheriff. Feiffer then announced that he did not have time to kowtow to some know-it-all New Yorkers then walked off, commenting that the Fantastic Four had been warned. While the Fantastic Four rented rooms at a nearby hotel, Deputy Feiffer visited the residence of a man named Quinn 20 miles away and informed him that the Fantastic Four had arrived. Feiffer warned Quinn that he suspected the Fantastic Four might be looking for the man. Quinn's daughter, Miranda (secretly the saboteur who had bombed Pier Four), explained that the Fantastic Four nearly ruined everything her family had built in Revelation and exclaimed that she might have to finish what she started in New York. The following morning, the Fantastic Four inspected their Fantasti-Car and discussed whether their saboteur was in Revelation. 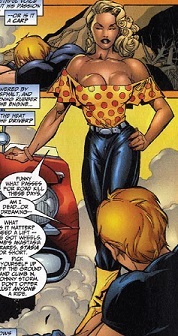 After the Human Torch left to do some aerial recon and the Invisible Woman left to speak with some of the townsfolk regarding their saboteur, Miranda returned and attacked the Thing, placing a bomb on the Fantasti-Car. Mr. Fantastic soon joined the fray but lost control of his elastic body when Miranda hit him with an electric jolt. Miranda then escaped while Mr. Fantastic attempted to disarm the bomb. In town, the Invisible Woman had no luck getting anyone to talk to her until she visited Ma Rose's Antiques and spoke with Desiree Longbow, the shop's owner. Desiree commented on a mirror in her shop which could show the user different things about themself each time it was looked in and the skeptical Invisible Woman soon found herself in the 1870s, aiding the outlaw Kid Colt against Moses Kincaid. Later, the Human Torch found something racing up the canyon and, upon investigation, came face-to-face with the Howler creature. When the Torch got too close to the Howler, he was attacked and left for dead near the road, where he was picked up Anastasia Contrares as he regained consciousness. That night, Mr. Fantastic and the Thing managed to get the Fantasti-Car working again and flew it to track their saboteur, who secretly led the two heroes to a cloaked, domed fortress. Once inside, Miranda open the dome's housing pens, unleashing alien, dinosaur-like Rippers against Mr. Fantastic and the Thing. Quinn soon arrived and called off the Rippers, revealing to Mr. Fantastic and the Thing that both he and Miranda were the last survivors of an alien race destroyed by an interstellar scourge called the Obliterator. Quinn also explained that Mr. Fantastic's recent work in mapping a lost space quadrant had alerted the Obliterator to Earth's presence and that the Obliterator mothership was on its way to Revelation. (Fantastic Four III#34) - The Obliterator mothership arrived and positioned itself in a geosynchronous orbit over Revelation before releasing the Obliterator itself into the town. When the Obliterator emerged, it destroyed Revelation's City Hall, prompting the Thing to jump into physical battle with it. Despite the Thing's efforts, he could not even distract the Obliterator. Revelation's townsfolk also entered the battle against the Obliterator, using their guns and other weapons to no avail. Quinn sent Miranda with the newly-arriving Human Torch and Anastasia Contrares to retrieve the Howler creature, actually another surviving Z'lyztaya alien who held the key to the escape ship of the Z'lyztaya survivors. While the Torch and Miranda attempted to recruit the Howler against the Obliterator, the Invisible Woman returned from the 1870s and was informed by Desiree Longbow that she was fated to learn something useful from her journey through time. Taking Longbow's advice to seek out her husband, the Invisible Woman met up with Mr. Fantastic as he and Quinn were trying to stall the Obliterator. Recounting the tale of her adventure in the 1870s, teaming up with Kid Colt to find a reflective crystal within the old Revelation mine, the Invisible Woman sparked an idea in Mr. Fantastic, who led the Fantastic Four to the present-day Revelation copper mine. Mr. Fantastic had the Fantastic Four dig up the present-day reflective crystal, deducing that the crystal was bathed in chronal energy and hoping to detonate the crystal inside the Obliterator mothership to scatter its atoms throughout time. Retrieving the Z'lyztayan survivors' Lightship, the Fantastic Four boarded the ship with the Z'lyztayans and flew into the Obliterator mothership, where they succeeded in detonating the chronal crystal and destroying the Obliterator mothership. Escaping the mothership as it was torn to pieces, the Fantastic Four landed back down in Revelation to find that the Obliterator had stopped moving with the destruction of the mothership. Thing then destroyed the hollow shell of the Obliterator and the Revelation townsfolk celebrated the Fantastic Four's victory over the mothership. Comments: Created by John Moore, Salvador Larroca and Art Thibert. Ma Rose's year of death, 1979, is topical. It seems more than a coincidence that Deputy Feiffer's name slightly resembles that of Mayberry's Deputy Barney Fife of The Andy Griffith Show. Anastasia Contrares was born in 1940 and became somewhat of a "hot rod" legend around the town of Revelation. By the 1950s, she had become the Queen of the State Racers but in 1961, she lost control of her car in a Revelation canyon and perished in the ensuing crash. Months later, Anastasia began became appearing as a ghost, still driving her el Dorado and refusing to leave the road, even in death. When the Fantastic Four arrived in Revelation, the Human Torch was attacked by the Howler creature (secretly a Z'lyztayan alien) and was left for dead by the road. Anastasia found the injured Human Torch on the side of the road and picked him up. She later drove him to meet back up with the Fantastic Four and remained to aid them until the destructive, invading Obliterator mothership was eliminated. Once it was destroyed, Anastasia said her goodbyes to the Human Torch, who had begun to develop a bit of crush on her, then departed. The Z'ylztayan Miranda then informed the Torch of Anastasia's true nature by taking him to visit Anastasia's gravesite. Anastastia existed as a ghost, able to mysteriously appear and disappear, seemingly at will. 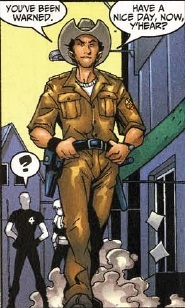 Police Deputy Beauregard Feiffer was present in the middle of Revelation when the Fantastic Four's Fantasti-Car landed after suffering a technological failure. Feiffer ordered the Thing to move the Fantasti-Car and warned the Fantastic Four not to cause any disturbances in Revelation. He then left to visit Quinn, whom he informed of the Fantastic Four's arrival. When the Obliterator mothership invaded Revelation, Feiffer saw that the Fantastic Four were determined to repel the mothership and began helping the heroes. Zed was an alien Z'ylztayan half-breed and navigator of the Lightship containing the family of Quinn, M'yrnda and Yssa. Off-planet when the destructive Obliterator mothership destroyed the Z'ylztayan home planet, Zed and the others escaped through a wormhole and crashed on Earth. 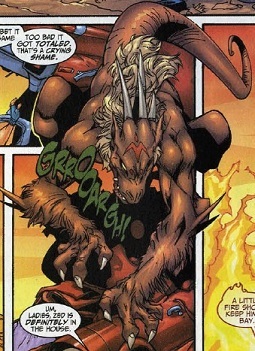 During the crash, Zed's mind became warped and he altered his form to slightly resemble the "Bigfoot" creatures of Earth's legends. Running off to live in the wild, Zed became a local legend of the town of Revelation, with witnesses calling him the Howler. When the Fantastic Four arrived in Revelation tracking a saboteur of their headquarters, the Human Torch had a run-in with the Howler while investigating the town and was left for dead by the road. When the Obliterator mothership arrived on Earth, Quinn realized they would need their old Lightship to escape Earth and, knowing that Zed was the only one who could recall its location, Quinn sent the Human Torch and M'yrnda to retrieve Zed. Visiting the Howler's salvage yard home, M'yrnda managed to calm the Howler into helping them find the Lightship. Once onboard the ship, Zed used the Lightship's Medcon to counteract his warped mind and he agreed to once more serve as navigator, helping the Fantastic Four's Thing to pilot the Lightship into the Obliterator mothership, where they detonated a chronal crystal that tore the mothership apart. As the Howler, Zed was stronger and more agile than the average human being, although whether this was common for a Z'ylztayan or not was unrevealed. Desiree Longbow was a precognitive resident of Revelation who had taken over ownership of Ma Rose's Antiques following Ma Rose's death. Much later, Longbow saw a vision of the Invisible Woman arriving in Revelation and was drawn to show the Invisible Woman a mystic mirror capable of transporting the users through time. 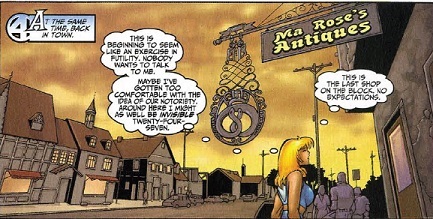 When the Invisible Woman indeed arrived, hoping to find information on the recent saboteur who had bombed the Fantastic Four's headquarters, Ma Rose's Antiques was the last stop on the block. Visiting with Desiree, the Invisible Woman was shown the mirror and transported to the 1870s into the body of a woman named Connie. When the Invisible Woman returned to the present day, Desiree greeted her and explained how she had received a precognitive vision telling her to show Invisible Woman the mirror. Invisible Woman then asked her what she was supposed to have seen but Desiree replied that she did not have all of the answers, some of which could find outside Ma Rose's Antiques, suggesting that the Invisible Woman seek answers in her husband Mr. Fantastic. Once the Fantastic Four had defeated the Obliterator mothership seeking to destroy Revelation, Desiree Longbow found the Invisible Woman and gave her a memoir book from 1910, claiming she had a feeling that the Invisible Woman had went into the past despite the Invisible Woman never telling Desiree what had happened when she looked into the mirror. Desiree Longbow had precognitive visions that showed her glimpses of possible future events. 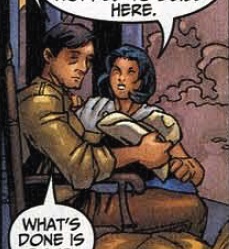 Quinn and his daughter M'rynda were some of the last survivors of the alien Z'lyztaya race destroyed by the interstellar scourge Obliterator. Having escaped their planet's destruction by being off-planet, Quinn and M'yrnda discovered a subspace transmission emanating from a wormhole at the edge of their solar system. With the Obliterator mothership in pursuit, the surviving Z'ylztayans went through the wormhole and crashed on Earth. During the crash, Quinn's lifemate Yssa perished and their ship's navigator Zed's mind was warped by the stress. Quinn and M'yrnda (who took the name Miranda on Earth) took up refuge disguised as humans living in the town of Revelation, a town known for strange occurrences. Upon learning of Mr. 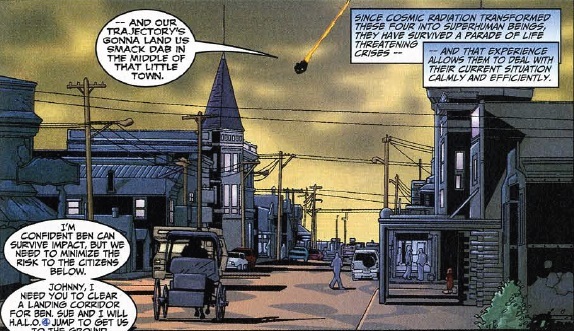 Fantastic's exploration of uncharted space using an interstellar transceiver, Miranda broke into the Fantastic Four's Pier Four headquarters and destroyed the interstellar transceiver with a bomb. Tracking Miranda to Revelation, the Fantastic Four eventually battled Miranda before Quinn arrived and explained that Mr. Fantastic's interstellar probe had alerted the Obliterator to Earth's location and that the Obliterator Mothership was on course to destroy Earth. When the Obliterator mothership released its Obliterator weapon on Revelation, Quinn decided that they would need their Z'lyztayan Lightship to escape. After Mr. Fantastic learned of a reflective crystal within the old Revelation copper mine, Quinn and Miranda aided the Fantastic Four in flying the Lightship into the Obliterator mothership and detonating the crystal, whose chronal energies tore the mothership apart. Once Revelation was safe, the Fantastic Four departed and said their goodbyes to Quinn and Miranda. Quinn and Miranda could transform into human form, seemingly at will.